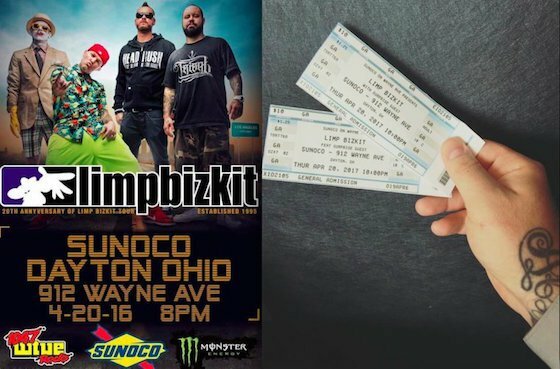 Home » Blogs » Limp Bizkit fans show up for fake concert. Limp Bizkit fans show up for fake concert. I want you to all know, I really struggled with writing a headline for this story. In 2016, its really difficult for me to use the band name “Limp Bizkit” and the word “fans” in a single sentence. Apparently, a couple hundred of them still exist in Dayton Ohio though! I’m impressed. If a couple hundred showed up, that’s 100 more than I would have guessed. Although, most of them might have just had nothing better to do. After all, it is Ohio. I’m not sure I would have believed this was real even if the band didn’t refute it. First of all, I’m not sure if a gas station is up to code for handling concerts of any size. It would just get nasty from the lack of bathrooms. Second, I’m thinking gas pumps + people potentially bringing booze or narcotics = something hilariously bad happening! I don’t care if they shut the pumps off. When you have these crazy synthetic drugs floating around now a days, anything is a possibility. Well, if you were one of the few that was disappointed that the gas station show didn’t happen, no worries. I’m sure you can book them at your next party for a respectable fee.